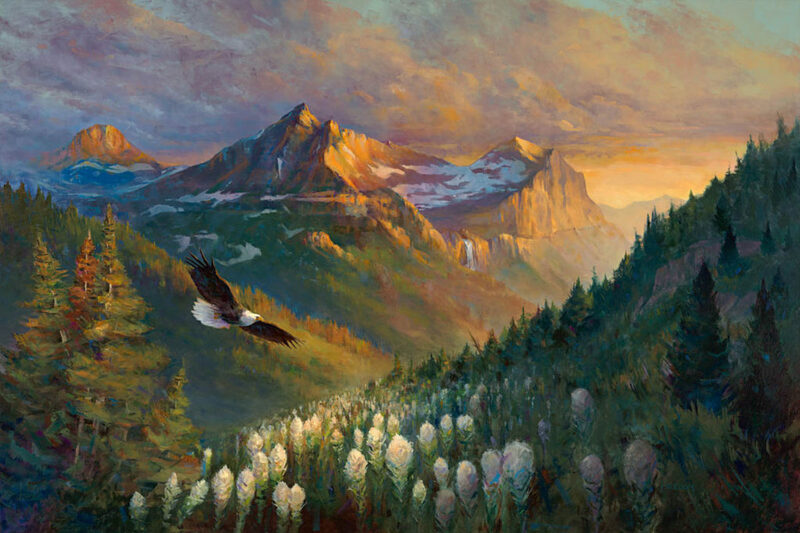 Freedom Bank’s Don Bennett commissioned local up-and-coming artist Colt Idol for an awe inspiring 6′ by 4′ oil painting depicting the majestic mountains and valleys of Glacier National Park and the symbol of freedom, the bald eagle. A limited number of 3′ by 2′ giclee prints were available for pre-sale and also for sale the day of the event. Those prints that were pre-sold were given additional unique brush strokes by the artist at the event at Freedom Bank, and all prints sold that day were embellished with the original signature of the artist. Giclee prints of “Discover Freedom” are still available for purchase. $100 of each sale of the premium quality, museum wrap format print benefits the Gateway to Glacier Trail non-profit organization. Now you have the opportunity to own an incredible piece of art and support a great cause – a separated pedestrian and bike path which will ultimately connect Glacier National Park with the Flathead Valley. To place an order, please stop by Freedom Bank, or contact us!